John Chavis was born free in either 1762 or 1763. His birthplace is somewhat uncertain with one source reporting it to be in the Bear Swamp District of Granville District, Colony of North Carolina. Apparently, he may have been indentured as a servant of Halifax (North Carolina) lawyer James Milner, a Presbyterian. Chavis is listed in a 1773 inventory of Milner's estate. Chavis served as a soldier during the American Revolutionary War. He enlisted in December 1778 and served in the 5th Virginia Regiment for three years. In a bounty warrant dated March 1783, Captain Mayo Carrington wrote that Chavis had "faithfully fulfilled [his duties] and is thereby entitled to all immunities granted to three year soldiers." A 1789 tax list of Mecklenburg County, Virginia, shows that he was listed as a free black man owning one horse. He had married Sarah Frances Anderson, and they had one son, Anderson Chavis. In 1789, he was employed by Robert Greenwood's estate as tutor to Greenwood's orphans. Sometime between 1792 and 1795, Chavis apparently resided in New Jersey, where he reportedly had taken private classes under the Rev. John Witherspoon in preparation for entering the Presbyterian ministry. In the recorded September 25, 1792, minutes of the trustees of the College of New Jersey (later Princeton University), there is a recommendation by Reverend John Blair that "Mr. Todd Henry, a Virginian, and John Chavis, a free black man of that state, ... be received" on the school's Leslie Fund. After Witherspoon's death in 1794, Chavis enrolled in Liberty Hall Academy in Lexington, Virginia, in 1795. The school was renamed Washington Academy in 1798, later becoming known as Washington College and then Washington & Lee in the late 1800s. 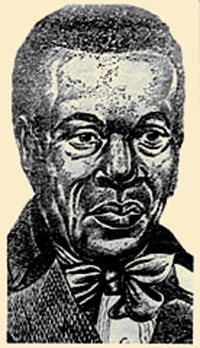 The Presbytery of Lexington (Virginia) licensed John Chavis as Preacher on November 19, 1800 — making him the First Black Ordained Presbyterian Minister in America. John Chavis preached in parts of Virginia and North Carolina. He settled in Raleigh and opened a school around 1807 or 1808. 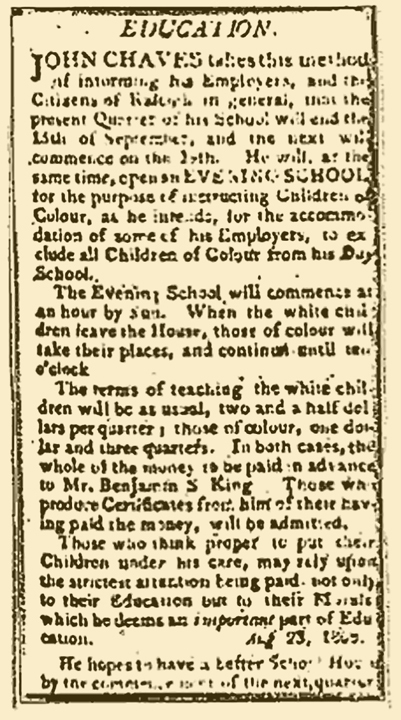 On August 26, 1808, the Raleigh (N.C.) Register ran an ad from Presbyterian educator, minister and free black John Chavis announcing the separation of his classical education school into a Day School for whites and an Evening School for black children. Since its start around 1807 or 1808, the school had been integrated up to this point. He taught his school as late as 1830. In the aftermath of the Nat Turner 1831 insurrection in southwest Virginia and the killing of scores of whites by revolting slaves, Southern states enacted harsh laws limiting some of the rights even of freed blacks. One of the laws that North Carolina imposed banned the teaching of black children. Chavis also had to discontinue preaching in North Carolina as result of statutes of 1832 forbidding slaves and free Negroes to preach or exhort in public. The Presbytery of Lexington continued to support Chavis and his family. John Chavis died in 1838. "at Timber Ridge Meetinghouse, the 19th. day of November, 1800, the Presbyn. of Lexington having received sufficient testimonials in favor of Mr. John Chavis, of his being of good moral character, of his being in full communion with the church & his having made some progress in literature, proceeded to take him through a course of trials for licensure & he having given satisfaction as to his experimental acquaintance with religion & proficiency in divinity, Presbyn. did & hereby do express their approbation of these parts of trial & he having adopted the Confession of Faith of this church & satisfactorily answered the questions appointed to be put to candidates to be licensed the Presbyn. did & hereby do license him the said Jno. Chavis to preach the Gospel of Christ as a probationer for the holy ministry within the bounds of this Presbyn. or wherever he shall be orderly called, hoping as he is a man of colour he may be peculiarly useful to those of his own complexion. Ordered that Mr. Chavis receive an attested copy of the above minutes." "On Friday last, we attended an examination of the free children of color, attached to the school conducted by John Chavis, also colored, but a regularly educated Presbyterian minister, and we have seldom received more gratification from any exhibition of a similar character. To witness a well regulated school, composed of this class of persons-to see them setting an example both in behavior and scholarship, which their white superiors might take pride in imitating, was a cheering spectacle to a philanthropist. The exercises throughout, evinced a degree of attention and assiduous care on the part of the instructor, highly creditable, and of attainment on the part of his scholars almost incredible. We were also much pleased with the sensible address which closed the examination. The object of the respectable teacher, was to impress on the scholars, the fact, that they occupied an inferior and subordinate station in society, and were possessed but of limited privileges; but that even they might become useful in their particular sphere by making a proper improvement of the advantages afforded them." Pictures - (Top right) Woodcut of John Chavis. Advertisement published in 1808 Raleigh Register newspaper.